The Strokes with the Chicago skyline as the backdrop! What an amazing weekend! Lollapalooza was one wild ride. Seeing so much talent and sharing great musical experiences with thousands of others in a three day span was incredible. We've always loved this Chicago festival for bringing a true mix of performers - this year's lineup ranged from Lady Gaga, The Strokes, and Erykah Badu to Gogol Bordello, Kaskade, and Mumford & Sons. What made it even better this year was that the organizers, C3 Presents, took advantage of the size of this festival to promote greener living and reducing our impact like never before. A pleasant surprise - Producers from C3 Presents were rocking Loomstate all weekend! Soft organic cotton is really the best for sweaty day-long festivals. 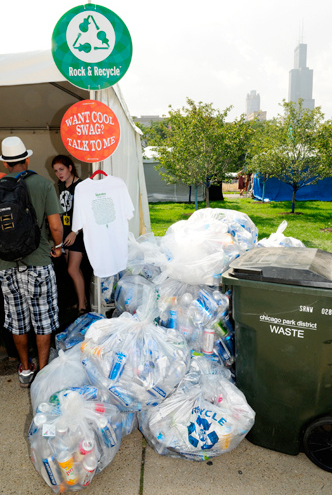 Rock & Recycle - free merch for collecting a bag full of recyclables. Participating concert-goers were around every corner. Last year, over 35 tons were collected. We wonder how much was collected this year! 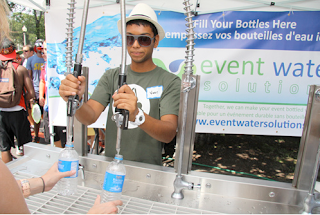 Attendees refilling their water with some serious pumps. If you forgot your bottle, they had a large selection for sale. Green Street was the first thing attendees saw walking through the main entrance. Accessibility is key! Green Mountain Energy provides an option to "offset" your carbon footprint from traveling to the festival. Proceeds go towards building a wind farm in Iowa and $3 makes up for 1,375 miles of plane travel - just about a roundtrip between NYC and Chicago. Global Inheritance, the people behind the fun recycling bins at Coachella, brought energy-making See-Saws and bikes for attendees to create their own snow cones to beat the heat. A fresh Blueberry-Raspberry dairy-free smoothie from the farmer's market. A great way to keep hydrated throughout the day. This eco-conscious message was as strong front-of-house as it was behind the scenes. Plastic bags were banned, only biodegradable ones were used if necessary, composting bins were placed behind all food booths and for all backstage catering, and organic options for food and merchandise were available. A biodiesel mix is used in all generators, and some are even powered by solar energy. They've partnered up with bike rental and bike valet companies to promote cycling as a transportation alternative. Business operations and travels on behalf of the organizers were calculated and offset through Green Mountain Energy, and these are only some of the green initiatives at the festival. This all didn't end on Sunday - they're keeping tabs on artist travels and transportation for this year's event to get a more accurate idea of its carbon footprint and how to make it lighter next year. Other large-scale events, take note! With recycling bins everywhere and constant encouragement, minimizing waste was effortless for those who already lead a green lifestyle and those who are new to it alike. Making it easy is really the most important part in motivating large crowds, and hopefully concertgoers left the festival with a greener perspective than going in. Read more on the festival here and a NYT profile on the organizers.